The .NET framework provides a number of commonly used dialog boxes. These are designed to allow familiar methods for user input. They include font, file and colour selection and printer configuration dialogs. This article describes the folder browser. In this article we'll look at the folder browser dialog box. 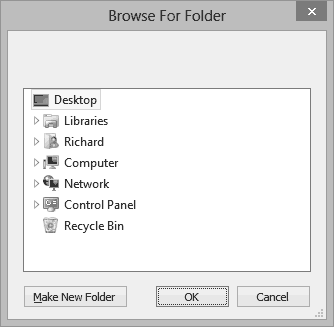 The folder browser dialog box is controlled by the FolderBrowserDialog class. This class is used to display a dialog box that shows a tree of file system folders, from which the user can select. The folders include directories on the local computer, removable drives and network shares. They also include libraries and special folders, such as "Documents" or "Music". The folders are automatically filtered according to the permissions held by the user. SelectFolderButton Button Text = "Select Folder" Displays the folder browser dialog box when clicked. FolderDetails Label Text = "No folder selected" Shows the folder that the user selected with the folder browser dialog box. As with all of the common dialog boxes, to show the window you call the ShowDialog method. The dialog box is modal, preventing the calling code from continuing until the user clicks either the OK or Cancel button, or closes the window in another manner. The clicked button is returned as a constant from the DialogResult enumeration. You should check that the return value is OK before performing any activity based upon the user's input.